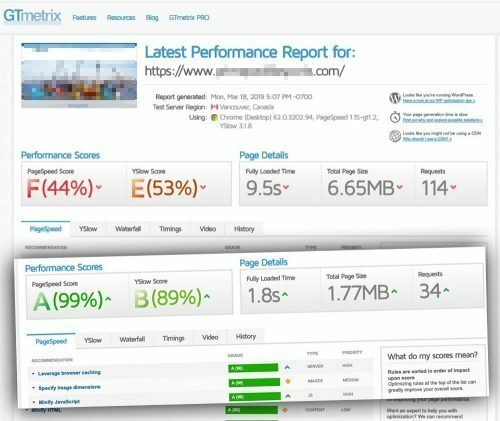 When we bring a new client onboard for a site cleanup we use the excellent GTMetrix tool to assess site performance before we begin and after we’ve worked on it. We’re always proud when we can see results like this. This client came to us with an “orphan website,” one that their previous developer had mostly finished and then disappeared. The site was built using the resource-intensive DIVI theme, hosted on a middle-of-the-road shared-hosting server. We’re pretty happy with the results before and after: Changing the performance rating from F to A, the PageSpeed score from 44% to 99%, the page load time from 9.5 second upload to 1.8, and the page size from 6.6 megabytes to 1.77. You can do most of those things yourself with the right high-quality, open-source plugins from the WordPress repository. Or get in touch if you’d rather we do it for you! ← Why Has Your Website Traffic Dropped?